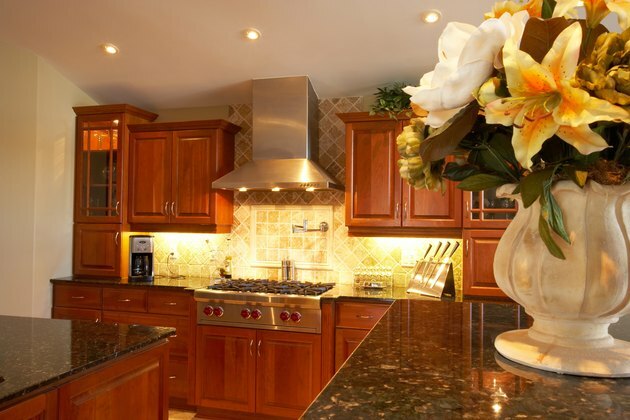 Sometimes you want to give your kitchen a makeover, but cannot afford to buy all new cabinets. Why not give your oak cabinets a whole new look? Not only will you save a lot of money, you will have the satisfaction of doing the job yourself. It doesn't take a lot of time to do and can be done in a weekend. By pickling your oak wood it will highlight the natural grain of your wood. This procedure is done to open-pored woods such as oak and ash. Wash the oak cabinets with a mixture of 3 tbsp. turpentine, 3 tbsp. linseed oil and one qt. boiling water. This will give your wood a good cleaning. This mixture is only to be used while warm, and you should wear rubber gloves to protect your hands. If the wood is finished, wash the surface well with TSP (trisodiumphosphate) and warm water. Rinse this off well and then dry the surface. Check the wood for any blemishes, because a finish seems to magnify blemishes. Sand the surface with 150-grit sandpaper. Vacuum the dust away with a shop vac and then use a tack cloth to finish cleaning. Apply a thick coat of pickling stain with a brush. Apply it in the direction of the grain. Or you can make your own by mixing 1 qt. of white latex-based paint and 2 cups water. Mix the two together in a container. You want the consistency thinner than the paint, but not as thin as water. Mix as much as you will need to do the entire project, otherwise you will need to make more and the two mixes may not match in color. This is applied in the same manner. Allow to dry for 10 minutes. This will penetrate into the wood. With a soft dry cloth, remove the excess stain. Use long strokes until you have achieved the look you want. You do not have too press hard as a light hand will do. The more stain you remove, the lighter it will be. Repeat the process of steps 3 through 5 if you want a whiter, less transparent look. Apply non-yellowing varnish to the wood with a brush, going in the direction of the wood grain. This will keep the pickling finish from being washed away. Leave this to dry for the time indicated on your varnish can. Mix the dark gel stain with water. This will be runny because you will need to wipe off as much of it as possible. Wipe it on in the direction of the wood grain with a cloth and then immediately wipe it off with a clean dry cloth. This will dry quickly, so only do small areas at a time. Allow to dry before proceeding to the next step. Apply a final coat of varnish. After the varnish is dry, you can replace the hardware of the cabinet.